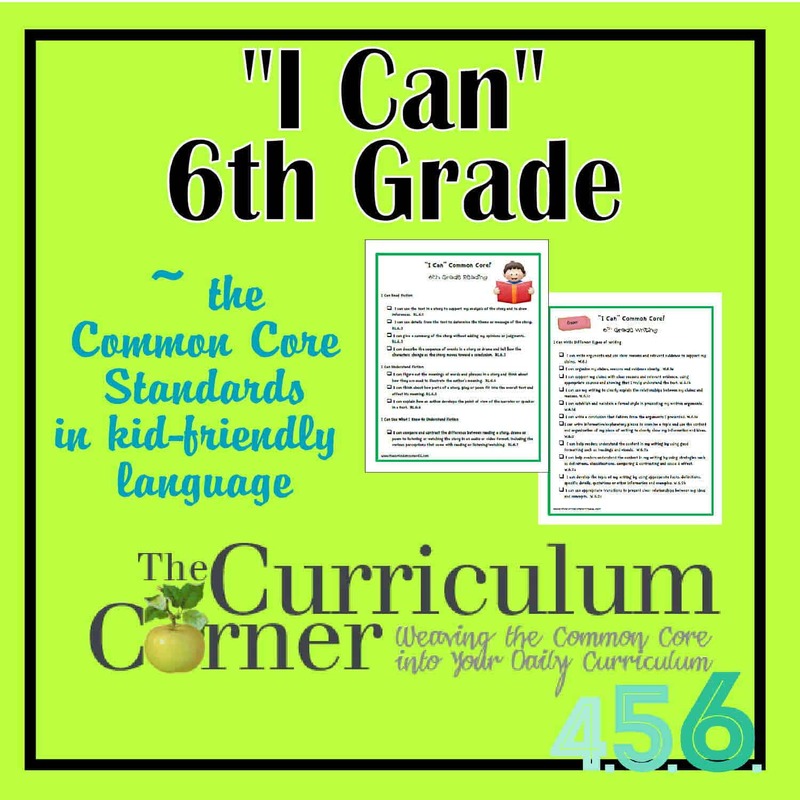 The Curriculum Corner’s very own “I Can” standards for Common Core. 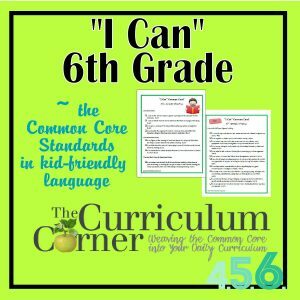 “I Can” standards are the common core standards presented in a kid friendly format. Use these to help students and parents understand the common core sixth grade standards. (Great to help teachers understand too!) They are presented as a checklist to help students self-assess their progress. These can also be a great way to make it clear to parents what skills may need extra home support. I am looking for I can statements for 6-8 science and technology. These are great! I was wondering if you could make one for 6th grade geared towardsscience? Hi Sindi! We are planning to do some science standards at some point, but not sure when just yet. We have so much on our to do list right now, but hopefully it’s something we will accomplish this school year. Thank you for taking on the task of putting the Common Core Standards in kid friendly format and language! This is so very helpful!! Looking forward to the Social Studies and Science Standards if and when that happens! The presentation of the “I Can” statements is perfect for my students and parents– simply stated and appealing to the eyes. These are the best kid-friendly posters I have found online.so far THANKS! Hi, I’m teaching 6th grade social studies and I’m looking for kid friendly standards. Are these available? Hi Sonia! We only have language arts and math since they are the current common core. We are going to try to get Next Generation science standards done this year, but we aren’t currently aware of any national social studies standards. What do you use? Are they standards from your state? Thank you very much. I have sixth grade next year and this is so helpful. First of all, I just want to thank you for putting all of this together and posting it up for other teachers! I’m currently teaching grades 6-8 ELA and Social Studies. I realize that you’re sticking to the elementary levels, but any chance you may know of a website with similar resources geared towards middle school? Hi Philippe! No, sorry…not currently aware of one. Maybe you should start one for the upper grades! 🙂 We will have 7th & 8th grade updated checklists (within the next month) and I Can statements at some point. (We have a middle school colleague who is working on the I Can statements for those grades since we don’t quite feel qualified for that.) Good luck finding resources. Thank you so much for the “I Can” helpful tool. I love it and use it everyday. Thank you….thank you….thank you!! THANK YOU for helping me!! I am starting to homeschool my children and would like to use CCSS as a guide about what my children should be learning. I am so lost with some of the language, and these I CAN statements help me know what to teach AND check that my children understand. These are invaluable to me and save me time trying to figure out the CCSS on my own! I already feel overwhelmed and this is like a breath of fresh air. I’m doing 5th and 6th grade this year with my kids. I will be sad to head into 7th grade without your resources!